A poll released this week among Venezuelan nationals found that 75 percent of Venezuelans reported losing “at least 19 pounds” in 2016, while 93 percent of Venezuelans said they do not have the money to secure three meals a day for themselves. The Living Conditions Survey, organized in part by three national universities, also found that 83 percent of Venezuelans were below the nation’s poverty line. While 78 percent of respondents confirmed that they eat breakfast, only 32 percent said they eat two meals a day. A combination of socialist economic mismanagement, government rationing of basic goods, and corruption have contributed to the situation in which Venezuela currently finds itself. For years, finding supermarkets properly stocked with basics such as flour, vegetable oil, and butter has been an odyssey for most Venezuelans. Under Hugo Chávez’s successor, Nicolás Maduro, the situation has become more desperate, with many Venezuelans resorting to extreme measures to survive. A poll released in September found that 15 percent of the nation relied on garbage, most from industrial businesses like groceries and restaurants, to eat. Over half of Venezuelans said they had experienced going to bed hungry, and a similar amount said they were forced to take days off from work to search for food. That situation has not improved — on the contrary, video surfacing this year appears to indicate that scavenging in garbage dumpsters for food has become so popular that Venezuelans now stand in line in front of dumpsters to look for food. Venezuelans have begun sharing their findings of garbage piles with high potential for containing sustenance on social media. 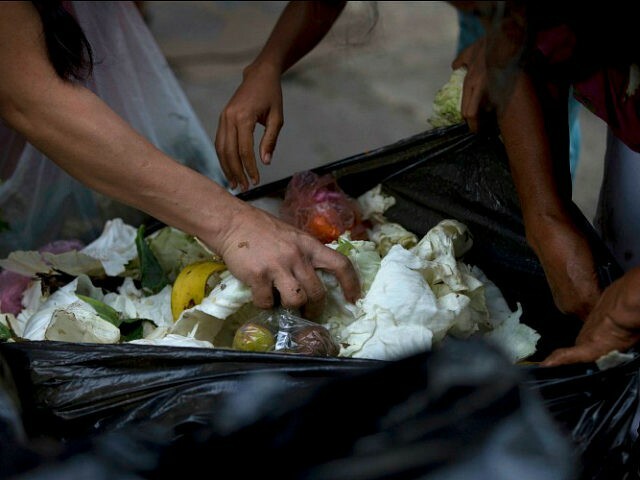 Venezuelans eating rotting food risk their health on a regular basis, and incidents of entire families dying due to eating old or rotted food have occurred. Desperation has also fed crime in one of the most violent countries in the world. The Miami-based El Nuevo Herald published a report last month detailing new robbery tactics growing increasingly popular among Venezuelan youth. Gang attacks on people leaving markets have become more common, while the frequency of robberies in general increased between 15 and 20 percent in most municipalities nationwide in 2016. Maduro has responded to the growing threat of famine with a number of measures that appear to have worsened the situation. Last year, Maduro ordered the military to take full control of the nation’s food supply. Soldiers in charge of the food subsequently began demanding bribes to ship it around the country. When they were not paid, the food sat in docked cargo ships, rotting on many occasions and worsening the scarcity. Maduro also created a government unit called the CLAP (Local Committee for Supply and Production) to monitor the distribution of food packages in urban areas. Anti-socialist groups have accused the CLAP of distributing the food only to known government supporters and threatening not to feed households that have expressed opposition to socialism. Maduro announced this week that he would expand the CLAP program to government salaries, meaning government workers would be paid with CLAP food packages. In some cases, government workers would receive ration tickets to be used at government-controlled markets for food.